How do I get the 100% on the 1st stage? I'm quite sure I killed everything a few times and it always displayed 97%. And when I wasn't focusing I would get 98%. This replay also shows how to safely finish off the final boss. I do not have strategical knowledge against him, but it's best to tap slowly left or right (you may need to pause to adjust your ship speed), or either create bombing runs on him (if you still have remaining bomb stock) in case you get pounded to the first level of your weapon. A new one, the last for now. I could get a little more points with all the tips you gave, guys, tks! I dreamed last night I beat 10 million. Oh well! Updated! Great to see a new score here. I should go back to this one and nail that final boss. It's been a while since I came into this score board. I finally found access to Hard Difficulty without needing to get to the second loop. To do it, you must HOLD DOWN, LEFT, I and II and press Run if you are playing on the TG-16/PCE. For the Wii, you must have the Classic Controller and HOLD DOWN, LEFT, A and B and press Start. (I don't know if this rule also applies on the Wii-mote, so please reply if you know one) On the Options, you would see the selections Stage, BGM, and Level. Highlight LEVEL, set it to 1, and it's a go! Level 1 (Hard difficulty) have enemies and bosses that take more punishment than Level 0 (Normal Difficulty). Oh! That's great. Worth adding a Hard Mode high score board then, right? 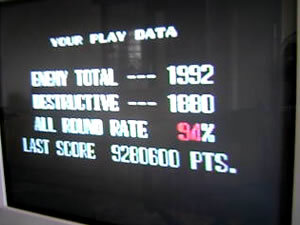 If I remember correctly, Hard Mode isn't a second loop; it's a new mode that you start from scratch with a zero score. That would mean people can either open it the old fashioned way or unlock it with a code... so we should have a board for it now, right? I'll do that in a couple of days if nobody objects, and add this code in the OP here. It's been a while since I came into this score board. I finally found access to Hard Difficulty without needing to get to the second loop. What do you mean with second loop? Is there a loop in Dead Moon? Yeah - I think that's the case. It's not a second loop. It's a new difficulty mode opened by clearing the standard version. The criteria, I think, is just '1CC the game'. Or can you credit feed your way to Hard Mode? This has to be one of the most grotesquely unbalanced scoring systems out there. Updated. Nice work on taking the bronze medal position! Gonna tackle the wonky scoring again and shooter for higher? !